Childish Gambino, Tame Impala, and Ariana Grande are slated to play the weekend’s top slots. Tame Impala shared the news on Instagram, adding that fans can expect “new sounds” from the band this year. Solange, Kid Cudi, Aphex Twin, Janelle Monáe, the 1975, Pusha-T, Blood Orange, Diplo, Weezer, Kacey Musgraves, Rosalía, Yves Tumor, SOPHIE, Mac DeMarco, Idris Elba, Jon Hopkins, Kaytranada, Anderson.Paak, Juice WRLD, Playboi Carti, Let’s Eat Grandma, Bad Bunny, Sheck Wes, Gesaffelstein, J Balvin, Tierra Whack, 070 Shake, JPEGMAFIA, and more are also on this year’s lineup. Check out the poster below. 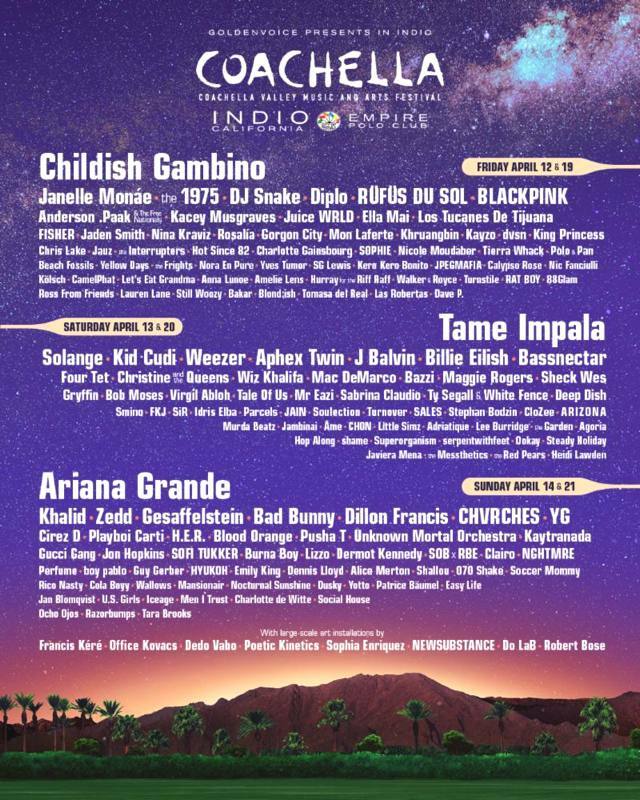 Coachella returns to the Empire Polo Club in Indio, California from April 12-14 and then for a second weekend from April 19-21. The festival will stream live on YouTube both weekends. It’s the first time both weekends will stream. Kanye West was widely rumored last year to be a headliner at Coachella 2019 alongside Justin Timberlake and Childish Gambino. (Kanye and Timberlake are not on this year’s lineup.) Earlier today, TMZ reported that Kanye pulled out of Coachella and won’t be headlining this year after all. The alleged fallout was reportedly over the stage’s size and design. TMZ reports that Goldenvoice refused to alter or remove the traditional main stage for Kanye. Pitchfork has reached out to Kanye’s representatives for comment. Ariana Grande has released her hit 2018 single “thank u, next” on vinyl. The 7″ pressing of the single, which comes with her recently released song “Imagine” on the B-side, is available to purchase on her website. “thank u, next” recently got a new music video, which featured references to early 2000s teen films such as Mean Girls, Legally Blonde, Bring It On, and more. Grande released her last LP Sweetener in August.